23-01-2019 | In een interview met Education Cannot Wait legt minister Kaag uit waarom Nederland investeert in dit multilaterale fond voor onderwijs in noodsituaties. Het ECW fonds is opgericht tijdens de World Humanitarian Summit in Istanbul 2016 om onderwijs een belangrijke plek te geven in de humanitaire hulp. Nederland was een van de eerste donoren om dit initiatief te ondersteunen en heeft sindsdien $24 miljoen bijgedragen. As part of its efforts to tackle the root causes of poverty and instability – and improve young people’s prospects the world over – the Netherlands plans to expand its activities to support education in protracted crisis and emergencies. In partnership with Education Cannot Wait, the Dutch Government is focusing its educational support on global hotspots, including targeted efforts in West African Sahel, the Horn of Africa, and the Middle East and North Africa, along with continued support to the Africa’s Great Lakes region, and Afghanistan and Bangladesh in Asia. The Netherlands is a core contributor to Education Cannot Wait, with US$24 million in signed contributions to date. 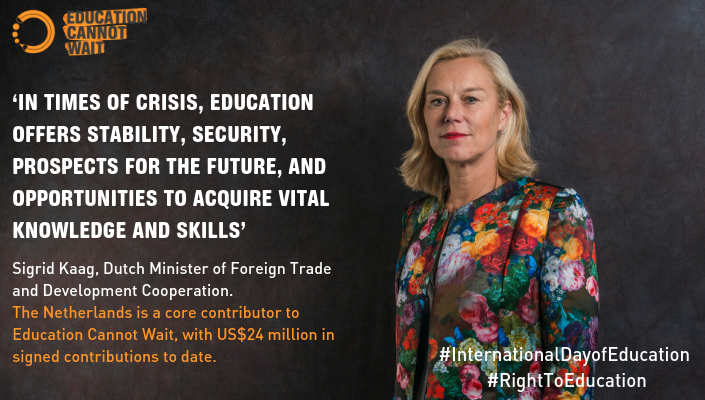 At the heart of this partnership between the new global fund for education in crisis and the Netherlands is the work of the charismatic Dutch Minister of Foreign Trade and Development Cooperation, Sigrid Kaag. A leading and high-profile global advocate for education in crisis with a broad and deep experience in development and multilateralism, Mrs. Kaag was appointed as the Dutch Minister in October 2017 after working for 25 years as a senior leader in the United Nations. Minister Kaag went to university in Utrecht, Cairo, Exeter and Oxford. After finishing her studies – which resulted in a M.Phil. in International Relations and a M.A. in Middle East Studies – she worked for Shell International in London and at the UN section of the Dutch Ministry of Foreign Affairs before joining the United Nations in 1994. A well-informed leader, Minister Kaag has served in numerous senior positions with the United Nations, starting with the United Nations Relief and Works Agency (UNRWA). Among others, she served as the Chief of Staff with UNICEF, and as Assistant Secretary-General for UNDP in New York. Minister Kaag subsequently was appointed by the United Nations Secretary-General to serve in two successive political leadership positions. From October 2013 to September 2014, as UN Under-Secretary-General, she led the mission to eliminate chemical weapons in Syria. In 2015, she was appointed the UN Secretary-General’s Special Coordinator in Lebanon. Why must education in crisis be made a priority in order to achieve gender equality, the Sustainable Development Goals, peace and stability? In times of crisis, education offers stability, security, prospects for the future, and opportunities to acquire vital knowledge and skills. If we forget the 75 million children and youth who are living in countries affected by emergencies and crises, we will not only fail to attain SDG 4 (to ensure inclusive and equitable quality education and promote lifelong learning and opportunities for all) but also fall short of other SDGs. Education gives people greater economic opportunities. Access to quality education is also key to gender equality: it helps us combat child labour, child marriage and sexual and gender-based violence, and enhances the ability of women and girls to make decisions about their own lives and bodies. In places like Afghanistan, where 2.2 million girls have been left behind and lack reliable and safe access to education, Education Cannot Wait is a timely global fund as it bridges the humanitarian-development divide and places gender as a priority of this pioneering work. The empowerment of girls and adolescent girls during an emergency and crisis through quality education is essential to achieving all the other Sustainable Development Goals. It is also essential in advancing peace processes and sustaining that peace. As a former senior UN official, can you explain the contribution that education makes to realizing the UN’s values and to pursuing multilateral efforts? Specifically, how will Education Cannot Wait, a new global fund hosted by UNICEF that seeks to mobilize US$1.8 billion by 2021 to reach 8.9 million children and young people living in crisis, help us achieve these goals? Education makes a particular contribution to a UN core value by giving children and young people the opportunity to live decent lives and find decent jobs. Education is also a human right, so investing in education is the right thing to do. Furthermore, education brings prosperity: one extra year of education raises individual income by 10 per cent. In times of crises, education provides safety and hope. As a rapidly growing fund with a focus on results, Education Cannot Wait contributes to multilateral efforts to be more responsive and to working together across the humanitarian and development spectrum to achieve lasting impact. As a broker and catalyst for change, this new Fund will be an essential actor in working toward more inclusive and equitable education for all. With the support of Education Cannot Wait’s donors, including the Netherlands, this is happening in places like the Lake Chad region, where 3.5 million children are at risk. That’s more people than the populations of Amsterdam, Rotterdam and The Hague combined. To address this issue, the Government of Chad is demonstrating a strong willingness to provide educational support for refugees. But there simply aren’t enough resources to deal with the influx. To avoid negative cycles of poverty, violence and extremism, the international community needs to come together, in partnership with organizations like Education Cannot Wait, to address this issue. And we must address it not as a series of individual challenges, but as an interlinked problem that requires coordinated responses across the human-development spectrum. This is one of the unique advantages of a global fund such as Education Cannot Wait. They can bring these stakeholders together and foster more agile and integrated approaches to our educational responses to crisis. How can the New Way of Working, through joint programming and linking humanitarian aid to development, be used to deliver education in crisis and emergencies? And what role can Education Cannot Wait play in linking relief to development in the education sector during protracted crises? Displaced people are displaced for an average of 17 years, so this is not a short-term challenge. There is an urgent need for humanitarian and development actors to join forces. I value Education Cannot Wait’s role in meeting this need and prioritizing education. By fostering development in humanitarian settings, Education Cannot Wait invests in young people’s values, skills and capacities. Their generation has a crucial role to play in shaping post-crisis societies. That makes them crucial actors in development. Think about the Rohingya children that are living in dire conditions in the refugee camps of Bangladesh. Around 400,000 children here lack access to education and live in dangerous environments where an education can mean the difference between safety and peril, and where sometimes the only food they will get in a day will be at a learning center. With Dutch funding and the contributions of growing group of donors, Education Cannot Wait is working with a multiple partners including UNICEF, UNCHR, UNESCO, Save the Children, Friendship and BRAC to expand learning centers in Bangladesh. This means children will have safe places to learn, play and grow. But we need to go beyond just first response, and the new US$12 million allocation from the Fund that will support 88,500 refugees will be central in efforts to create a long-term resilience programme in Bangladesh. You are a champion of education – especially education for the world’s most vulnerable children. Can you explain the importance of education to the Dutch development strategy? Dutch policy takes SDG 4 as a starting point. Not only is education a human right; it should also lead to empowerment. By increasing people’s autonomy and capacity for self-determination, education should provide equal opportunities for all. My policy gives priority to the poorest people and the most marginalized and excluded, including women and girls, young refugees and refugee children. It focuses on appropriate education that includes three sets of interrelated skills: basic numeracy and literacy (foundation skills), life skills (transferable skills), and technical and vocational skills. All three skill sets are necessary for the personal development and empowerment that make it possible to find a decent job and have a decent life. It is important that transferable skills are included in education in humanitarian situations through Education Cannot Wait-financed programmes. As a government minister and former senior UN official, can you share some reflections on education and SDG 4 in achieving the 2030 Agenda for those left furthest behind: refugees, girls and children with disabilities? How is SDG 4 connected to the other SDGs? In my opinion, a great injustice is being done to those left furthest behind. I believe that education, decent work and gender equality, particularly for young people, are at the heart of the 2030 Agenda. I would like to congratulate Education Cannot Wait on its strong gender strategy, especially with regard to SDG 5 (to achieve gender equality and empower all women and girls). I look forward to seeing this strategy implemented over the upcoming months and years as the Fund brings its initial efforts to scale and expands its reach with both expanded first emergency responses that are responsive to the unique needs of girls, as well as multi-year programming that will empower girls for generations to come. This can only happen by increasing women’s participation in political decision making and leadership, by increasing economic empowerment and improving the economic environment for women and girls, by preventing and eliminating gender-based violence, and by strengthening the role of women in conflict prevention and peace processes. Because we know that the 2030 Agenda cannot be achieved without partnerships, I would like to stress the importance of SDG 17 (to strengthen the means of implementation and revitalize the global partnership for sustainable development). I look forward to seeing even more complementarity and partnership between Education Cannot Wait and other key actors such as the Global Partnership for Education. Only in partnership can we ensure that every child and young person has access to appropriate, quality education by 2030.